Frank Green was an avid collector of antiques and lived in Treasurer’s House between 1897 and 1930. He filled it with things that he loved and at became a treasure trove of historical artefacts. 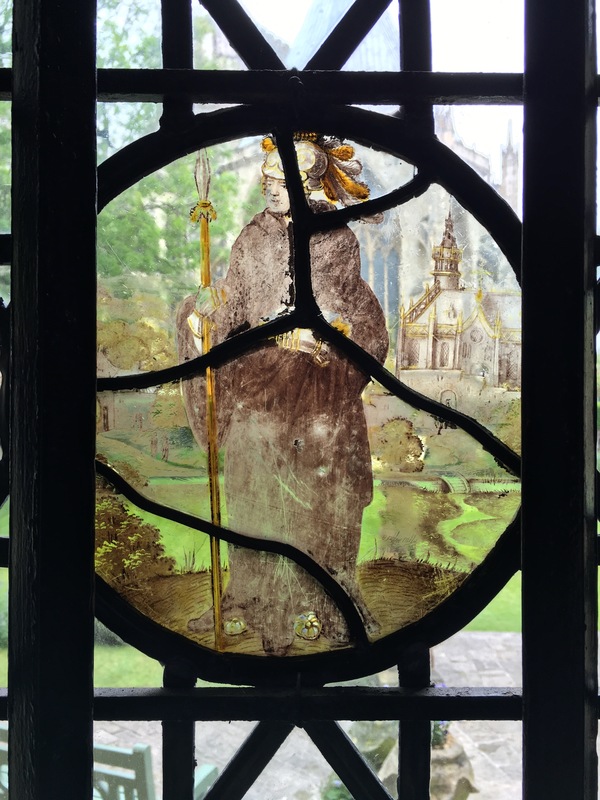 He bought at least one – maybe more – of the six glass roundels in the house from an apparently well-known Dutch Antique dealer, Mr Van Staaten. 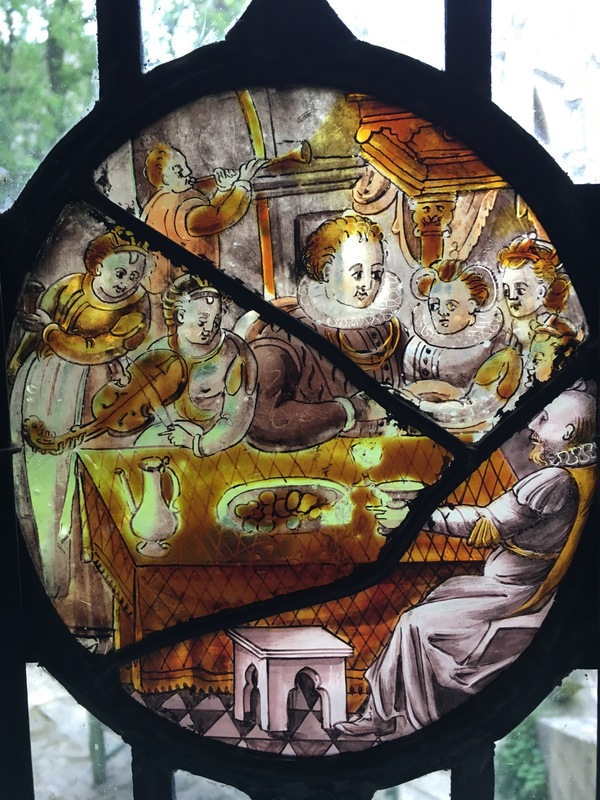 Frank correctly presumed that these panels were from the Low Countries and although we do not know the artist or exact date of the roundels we can date them based on the costume of the subjects. Scene at a banquet with musicians. Treasurer’s House – Great Hall – artist unknown. This is likely to be the earliest of the collection of roundels with the others dating from the 1600-1700s. The date has been decided based on the Tudor style of the costume. In this one scene there is a great deal of detail and successful display of perspective. The roundel measures approximately 25cm high. It has had some previous damage in the form of cracks which have been secured with mending leads but the paint appears to be stable and does not suffer from loss. Standing in a field before a thatched house these men are likely to be farm hands – one holds a pitchfork. This panel is the most damaged with replacement pieces and lots of mending leads. The paint is faint and it has suffered from paint loss in the past. The woman has been identified as St. Catherine as she has a broken wheel and sword at her feet. An armoured man dressed in plumed helmet and gauntlets holding a spear. In the background is a church and rolling hills. 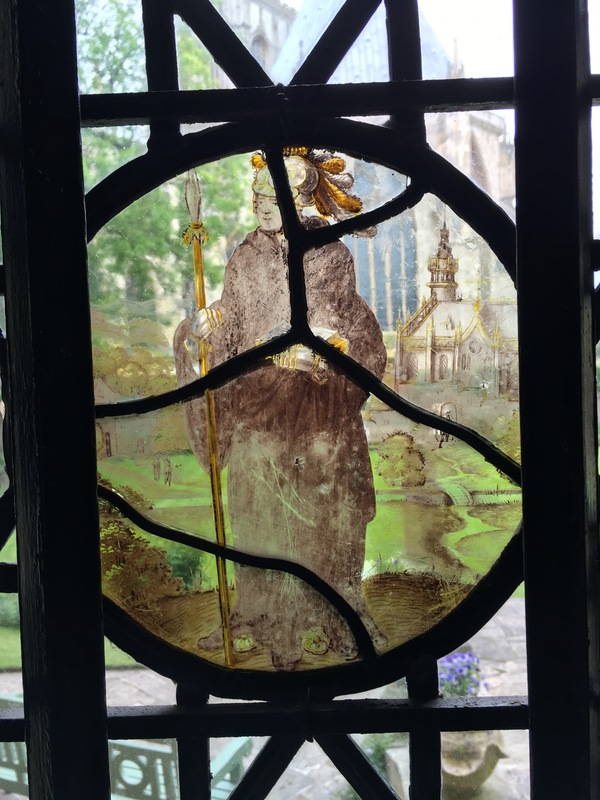 This panel is in the same style as the ‘Crowned Woman’ representing St Catherine so he could also be a saint but has not been identified. This panel has lots of cracks and mending leads. 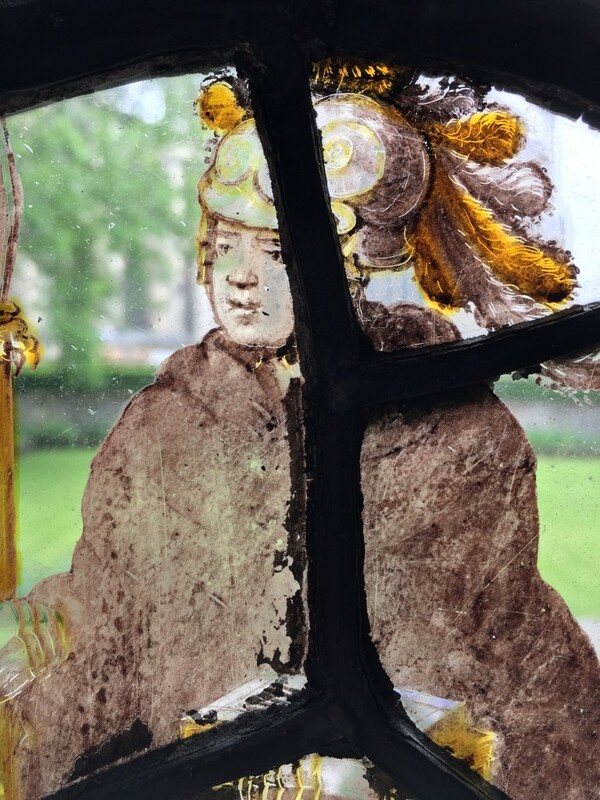 Man with Plumed Helmet – 1600-1700 – Treasurer’s House, Great Hall – artist unknown. Before conservation cleaning. Before cleaning all of the panels had accumulations of dirt and dust which had gathered on the surface, especially along the sides of the lead. The National Trust cleaning approach for cleaning painted glass is rolling cotton buds over the surface of the glass. The cotton bud had been soaked in distilled water. Detail of the Man with Plumed Helmet before conservation cleaning. It was essential to carry out a spot test on the painted glass in a discrete area to ensure that the paint was stable enough for cleaning. This was done 24hours before the full clean. It gave us the satisfaction of knowing that the paint was indeed secure enough to clean using this approach and that no adverse affects had occurred in the intervening period after the glass and paint had dried. Man with Plumed Helmet – 1600-1700 – Treasurer’s House, Great Hall – artist unknown. Post-conservation cleaning. 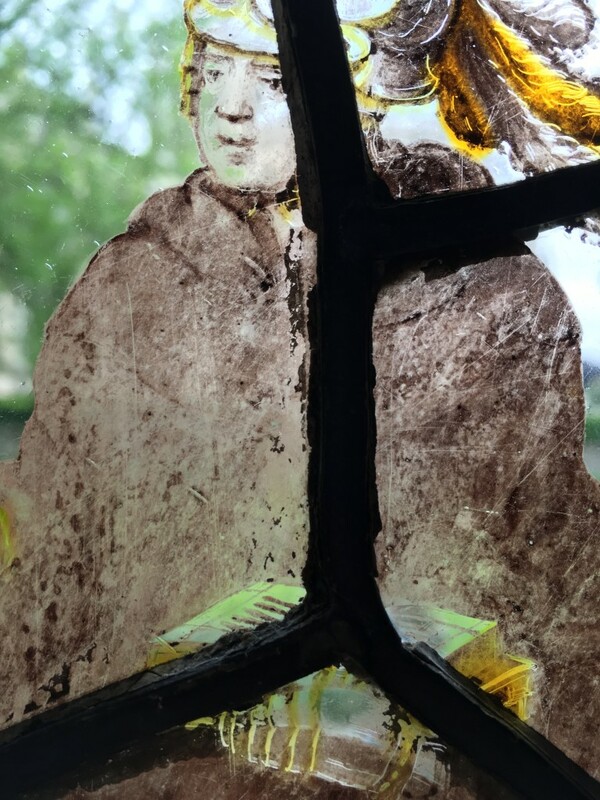 The conservation cleaning took several hours, carefully rolling the cotton buds over the surface of the pane, paying particular focus to the areas close to the mending leads. The result was satisfactory and the majority of the dirt was removed. As can be seen from the detailed images there are some remaining spots of built up surface dirt. In cases such as this it is inadvisable to attempt to remove them because this pits the paint underneath in danger of being removed and lost. Detail of Man with Plumed Helmet – Post-Conservation cleaning. It was a treat to work on these lovely panels and aid their survival onto the future. Although it may sound easy to carry out the work I have talked about in this post please leave conservation cleaning to trained professionals.